There’s no better way to say happy mother’s day than with some blood, sweat & tears – you know, to really show her how much you care… 😉 Well that’s kinda what you can do by taking part in the Volunteer Wildfire Services (VWS) Trail Challenge this Sunday, 13 May 2018, as you’ll not only be starting off the day on some of the most beautiful mountain terrain in the country, but you also stand a chance to win your mom a really cool prize. This 13th edition of the VWS Trail Challenge is open to all, both avid trail runners and trail walkers alike. There is a choice of 2 routes: a 10km or a 20km, both giving you the opportunity to experience the beauty that is Deer Park, the slopes of Devil’s Peak and Table Mountain. This year’s race will also take you through some of the areas that have once again seen the destruction of wildfires which the VWS helped combat. 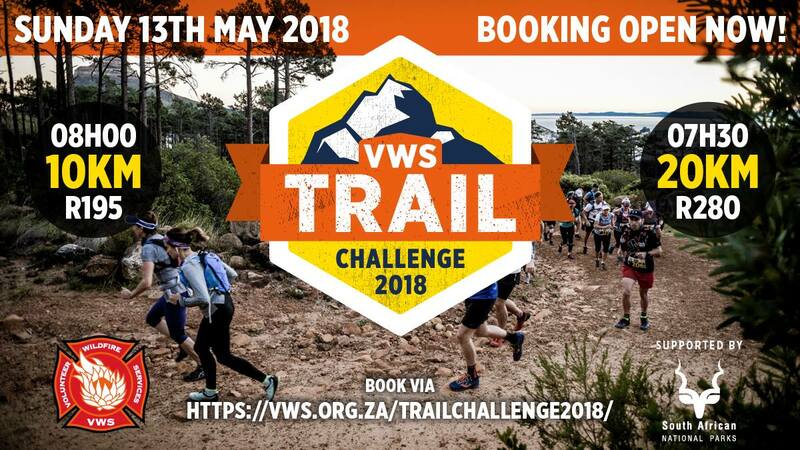 The trail challenge is run & organised entirely by the VWS wildland firefighters and all proceeds go towards the VWS which is an entirely volunteer-run, non-profit organisation dedicated to the protection of biodiversity and preservation of our natural heritage and water catchment area. The funds raised will be used for operational expenses to fight wildfires and any additional donations are also welcome & greatly appreciated. The race Start and Finish is located in Deer Park, Vredehoek, Cape Town. Check out the route maps over here.